Rinse and dry mung bean sprouts. Lay out sprouts on cutting board and roughly chop. In a bowl combine mung beans, cucumber, snow peas, cherry tomatoes, scallions and cilantro. In a separate bowl whisk together dressing ingredients, soy sauce, 2 tablespoons lemon juice, honey, olive oil and red pepper flakes. Preheat stainless steel skillet over medium-high heat for 2 minutes. Rub tuna with remaining lemon juice and season with salt and pepper. Place on hot pan and cook for 1 1/2 minutes. Turn and cook another 1 1/2 minutes. Cut tuna into cubes and toss with rest of salad ingredients and dressing. A fruity breakfast smoothie to start the day. 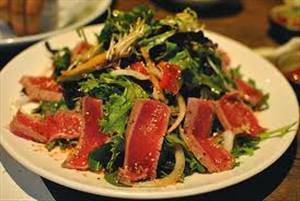 There are 231 calories in 1 serving of Seared Tuna Salad. Calorie Breakdown: 20% fat, 26% carbs, 54% prot.